It’s welcome news that Oklahoma City Mayor Mick Cornett has appointed a task force to study how to make the area safer during the type of violent and destructive weather we experienced May 20. The violent May 20 tornado in Moore and the Oklahoma City area left at least 24 dead, injured more than 300 people and destroyed more than 1,200 homes. Let’s hope that Cornett’s group comes up with some good ideas or at least sanctions ideas that have been around for a long time, such as requiring storms shelters in new homes or building neighborhood and community shelters. The idea of building reinforced, tornado-safe public buildings, such as schools, is another good idea waiting approval by the top leadership in this place. But let’s also don’t fool ourselves. The May 20 tornado primarily devastated Moore, much like the May 3, 1999 tornado, and the location of these tremendously violent tornadoes is extremely important. If Moore is Tornado Alley Central, then Moore leaders and residents need to be as much involved in making their city safer as rebuilding and essentially announcing open season for tornadoes once again. In the end, it might take state or federal intervention to make any difference. So I would like to propose an idea. Let’s don’t rebuild homes in those heavily damaged areas in Moore, but, instead, create space for a state-of-the art violent weather research center, a museum that shows us the history of violent tornadoes and an active center for first-responders, who have special training in responding to natural weather disasters, such as tornadoes. I want to be very clear that I don’t mean the homes should not be rebuilt, just simply not in the place designated for the new complex, which would be built in the most heavily damaged area. If tornadoes continue to strike in this area of Moore, highly likely for a variety of reasons, including climate change, then the complex can grow exponentially. Let’s look at this proposed complex, perhaps named Tornado Alley, in more detail. 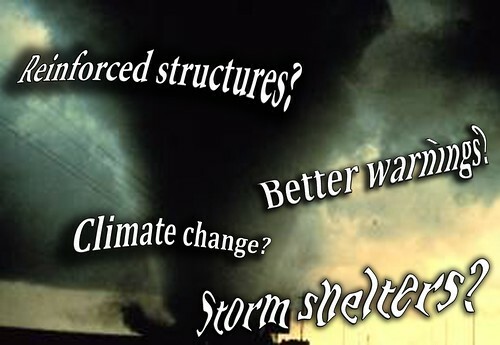 (1) I envision a research center that not only does laboratory and weather calculation work, but also builds test structures that can withstand the force of a large tornado. The structures could be tested on site through actual weather occurrences and simulations. Obviously, one main purpose of the center would be to determine the causes for why this particular strip of geography in the world is so susceptible to major tornadoes. Is there something we might do to change that? (2) The museum, which would charge admission, could be both a way to partially or fully fund the entire complex. It would include photographs and videos of major tornadoes, scientific explanations for them, and, perhaps, a large tornado simulator. The museum could also exhibit tornado-damaged artifacts. Its mission would be to seriously educate people here and elsewhere about tornadoes, but it’s easy to see why such a museum would be extremely popular. (3) Imagine leading edge disaster equipment housed in a tornado-safe structure and manned by first responders trained especially for the type of violent weather we experience here. That would be the main point of Tornado Alley’s first-responders center. Those who work there obviously would have other duties in the area, but during violent-weather season, they would be on high alert. The center would also contain the world’s largest community underground shelter. The entire complex would be completely tornado-proofed, a model for how we might build public structures here. This proposal would help Moore and the entire Oklahoma City area overcome any stigma it might have as the world’s epicenter for violent tornadoes and also add to the local tax base. It would tell the world we’re serious here about improving tornado safety not only for ourselves, but also for the entire world. It would also honor those who have lost their lives by tornadoes here and elsewhere. The scope and structure of this proposed complex could be adjusted, of course, or limited, but why don’t we do something different this time instead of rebuilding relatively flimsy houses in the same spot where a tornado just pulverized the same type of structures into rubble? With more tornadoes in the forecast over the next few days, that robotic repetition seems like insanity.